Come celebrate and learn about sanctuary with chimp experts, brand new photos, and a chance to double your gift! 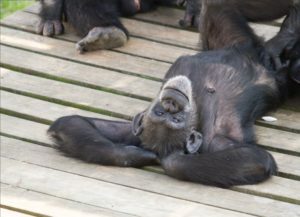 Relaxing in the shade, hands clasped behind her head, eyes sparkling, Lori is the perfect picture of a chimp enjoying sanctuary. See this striking photo and more in the newest edition of Animal Protection of New Mexico’s (APNM) magazine “Making Tracks”. Since the Chimpanzee Sanctuary Fund’s first round of grants last spring, you believed in our mission and made miracles possible. Today, 44 New Mexico chimps have moved out of lab settings and into the peace and safety of sanctuary with our support. Let’s celebrate as we press ahead! Even if you can’t attend, please consider supporting the movement of more chimps to sanctuary by making a gift. Help us meet our goal of raising another $9450 by June 17th and provide support for two more deserving chimpanzees to head to sanctuary. Donations made to our Chimpanzee Sanctuary Fund will be DOUBLED thanks to generous support from the American Anti-Vivisection Society. Please give now.